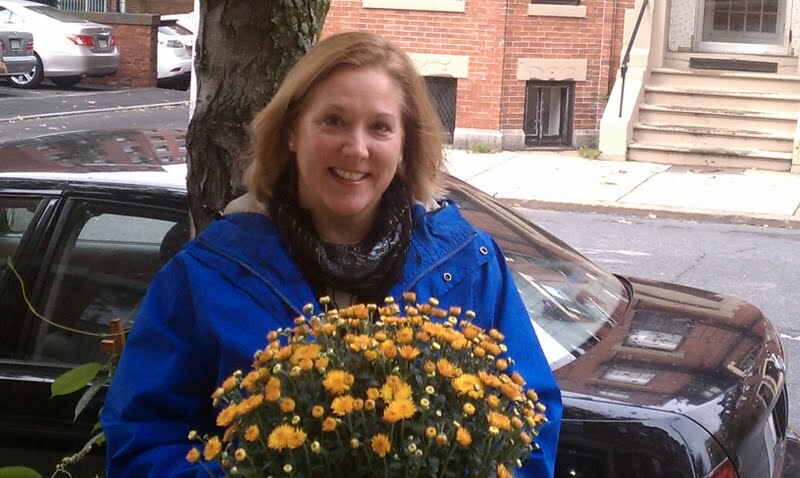 Last Sunday I purchased five, 6″ garden mums – four rust colored and one Sundance yellow. Plus two, 6″ sunflower plants to plant in the front of the garden and kick up the contrast. Got the plants for a great prices at The Blooming Place on Rt. 53 in Weymouth (and in Norwell on Rt. 228). Four mums for $15. The sunflowers were $3.99. I had checked out the mum supply at Home Depot and they were quite a bit more. While not my favorite flower, the chrysanthemum can withstand colder temperatures so they are a great replacement for summer plantings. 1. Buy mums at a local garden store in your choice of colors. Those with tight buds will last longer. 2. Choose a sunny locations. Mums need about 5 – 7 hours of sun daily to thrive. 3. Dig holes that are as deep and wide as the mum’s container. Remove the container and set the plant into the hole and cover with soil. 4, Water thoroughly. Then water daily for at least a week. If it rains, you are off the hook. Mums need to be watered several times a week to stay hardy. 5. Remove any dead flowers using the pichback technique. Simply use your thumb and index finger to pitch off the dead flower. This pruning helps the mum stay compact and full.